Dior Extreme Cutout Sandal, $780, from left; Louboutin multicolor bootie, $1,065; and Salvatore Ferragamo Nocciola with Lucite wedge heel, $995. Shoes from neimanmarcus.com. Let's be 100 percent clear. I am not a shoe person. For a long time I prided myself on my restraint compared to many women I know - whose patron saint is Imelda Marcos - who live and die for the love of shoes. I never got it, perhaps because of my Cinderella-size feet, size 3 U.S., that are next to impossible to fit, and perhaps because my job requires running about. One of my early career memories was of a reporter, now at Brand X, who always saw fit to wear high heels on the job, never mind that she might be called upon to dash to a murder scene, fire or flood. For a long time, our walls were adorned with a photo of her being carried out of harm's way by a rescuer at an evacuation scene. Carried! The photo served as a cautionary reminder to female reporters never to be that hapless damsel in distress. I dismiss those women - you know the ones - perched on their wobbly heels, unable to move quicker than a tortoise. (It's a different story if you have command of those heels. In that case, I bow to you.) I have, from time to time, found myself in the company of the hobbled, resentful of their slow pace and persistent whining about their aching feet. "Why'd you wear those shoes if you know you can't walk in them?" I'd snap, wondering why anyone would choose certain misery. THEN the economy changed, and with it came more sober fashion and ladylike styles reminiscent of the World War II era. Suddenly it didn't seem as important to have the next It bag or a new dress when our closets are already stuffed with clothing. 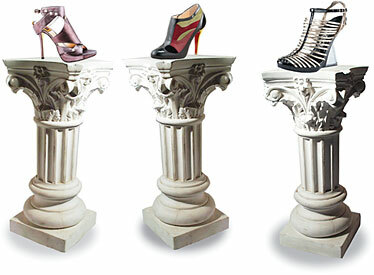 Designers aiming to create the next It thing found it in footwear. The steady, 50-year parade of monotonous pumps, strappy evening sandals and casual wedges changed with the 2008 spring season, when shoes suddenly became sculptural, architectural works of art, with a whole lot of straps and vamp details. The standout was Prada's Art Nouveau pumps, inspired by petals and insect wings. Current designs suitable for today's apparel are reminiscent of the 1930s and '40s, recreated with 21st-century materials and degrade techniques, plus look-at-me combinations of innocence and sexiness, such as Mary Janes paired with potentially lethal fetish heels for the leggy pinup look. And prices have soared by the same percentages as real estate. Where once you could get a stand-out shoe for about $250, you're now looking at $550 to $800 for Manolos (not counting boots) and $600 to $1,200 for Louboutins. You can find great style for much less. I hit up Nordstrom Rack on three occasions and came away with about eight pairs of shoes for $20 to $100 each. I blogged about the experience and now I'm meeting strangers who have compartmentalized me in their brains as "the one who likes shoes." Well, I guess now I do, although I'm not so far gone that I don't know my limits. I know which ones will allow me to stand for two hours or one, and I know which will only get me from car to door, and I plan my evenings accordingly. » Admission: Free; reservations required. Ages 21 and older only.